The eagle is another symbol for Scorpio. My friend Michael Wolfstar, who runs the website Neptune Cafe, wrote to me after reading my previous post American Aprils. He didn’t disagree with the substance of it, but he wanted to point out that the chart he uses for the US has Scorpio Rising –– and it works better than the widely used Sibley chart. I asked him for his reasoning. He sent me a long piece he’d written explaining exactly why Scorpio Rising is right. So I went and read what he had to say — and came away convinced. This is a very sound argument. Here’s what Michael he had to say. “The Scorpio Rising national horoscope is catching on, but many feel that Scorpio just doesn’t fit the American identity. In basic astrology, the Scorpio archetype is naturally associated with the warrior. The U.S., as the world’s reigning superpower, has by far the largest military complex. The Pentagon’s budget is larger than the next 17 nations’ military budgets combined. Across the planet, other nations feel the influence of U.S. military power. “Or, one could think of the Scorpio archetype on the national level as a financial power house. In the earliest times, the U.S. economy was largely built on the backs of slaves who comprised a full one-third of the population during the Founding Fathers’ day. Later, loans from England, and the growing ability to leverage capital allowed corporations to grow in influence to the point where corporations nowadays have the same constitutional rights as people. When Scorpio is rising, four planets are found in the 8th house of capitalism, doubling the sense of Scorpio as a corporate archetype. “Scorpio is associated with the eagle which is the nation’s national symbol. One of the nation’s proudest moments came when Apollo 11 landed on the moon. Astronaut Neil Armstrong’s first words at this historic moment were “The Eagle has landed.” The eagle is the centerpiece for the Great Seal, which is used to authenticate passports, military insignia, embassy placards, all the nation’s currency, and various U.S. flags. To read the rest of his excellent piece, click here. The more you look at it, the more it makes perfect sense. Put simply, what this suggests is that Pluto-Power drives the USA from the inside and intensifies everything – including the more empathetic values related to home, family, community and the gregariousness, enthusiasm for new ideas and willingness to communicate etc. In the area of technology alone, I’m willing to bet there would be numerous and fascinating correlations between nearly all well established tech enterprises (somewhat remarkably many of them have their geographic origins in what was once a small hamlet – Palo Alto) and the national chart. That is another Scorp / Pluto tale in itself. Code. Deep research. Thoroughness. Secrecy. Behind the scenes etc. And we haven’t even got to the fixed stars yet – lol. I’m clearly brainstorming in general terms here, but the U.S. Scorpio Rising Horoscope is a very interesting proposition and well worth exploring / testing in more detail. Andrew – the reason Michael wrote to me was because this chart works better with many recent events including 9/11 and this Boston bombing. The aspect that I pointed out between transiting Sun and natal Pluto and Moon still holds, but added to that is a perfect square to the progressed Ascendant in Cancer from the Mars-Sun conjunction. I never felt comfortable with the Libra MC in the Sibly chart, but I liked the Sagittarius. BUT you get the Sag flavour anyway from Sun in the 9th and Sun-Jupiter conjunction. 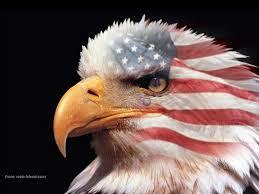 Weirdly, one of the reasons I was so taken with this idea is simply the American eagle, the symbol of the country. The Sun in the 9th (ideals, law, visions, beliefs etc) + the Sun/Jupiter conj brings a lot of “up” energy into the chart. It can be a great combo: sense of hope, enthusiasm for new ideas, the quest for truth, a “can-do” attitude, regardless of circumstance. That is to say: identifying shocking / deep impact events is one thing, but you need to balance that with *how* a nation responds. The Sun in the 9th clearly plays a major role here. Even if Michael’s thesis falls down in places (which it might, under more scrutiny) at the very least he’s helped articulate something about the inner character / dark side of the USA. After reading through some of his own research it looks like he’s really onto something. But, surely – wouldn’t a Scorpio ascendant make much more withdrawn and not be so overall present in the whole world and be very, very, very reluctant to interfere in other countries? Yes, that was pretty much what I said to Michael — Scorpio is more with-holding, which is not the American way at all. I was thinking more in terms of culture. On the other hand, I don’t think Scorpio is reluctant to interfere, especially militarily. Plus there’s the Sun in the 9th and Leo on the MC. I do think of America as “king of the world” — at least at the moment, rather than politician of the world (that really doesn’t work as a phrase) which would be the Libra MC. I don’t see America as politician of the world, they act more as police officer of the world. And Scorpio can and will interfere, but only if it is threatened itself. Otherwise it prefers not to be involved in other people’s affairs at all. Of course it could be the Sun/Jupiter conjunction that comes through stronger. We can all see that america is a right-wing country, this is despite having planets in cancer. Plainly put saturn squares the sun. Saturn in libra has control over the sun in cancer. The right wins. The only other aspects are an on the edge of the limit conjunction of venus and jupiter – surely that must be good and is the cause of material wealth and completely overdoing it. However jupiter squares chiron which must be some bad fortune in regards of career. Wait there – hasnt saturn by transit been aspecting the natal venus/jupiter/chiron. Well that explains a lot. Saturn – End Of – Jupiter/venus/chiron – career and prosperity. Scopio ascendent? who knows? its not the asc or the house postions that matter what trumps is the aspects between the planets. Scorpio is a good sign for US. Remember USSR, for example, began its existence under the sign of Scorpio ! Hey DR, great to hear from you. I might do a bigger link to that post. Hope you’re having a wonderful time. Sibley isn’t a proper chart for the US. I always recommend the chart for the first government instituted by settlers on the new land: The Mayflower Compact of 1620. This is the first government that explicitly acknowledged that its power was granted by the goverened. Its principles were drawn heavily upon for state governments, and eventually the Unitied States. Mayflower Compact chart is difficult, because it’s in old Gregorian dates (must be converted first). And we don’t have a signatory time. I did a noon chart, as a wild guess. ButI I like it. Sun conjunct Mercury at the MC, Pluto conjunct Jupiter in Taurus in the 3rd house. This stuff explains a lot more than the Sibley chart does. Oops I meant to put up an actual chart of the Mayflower Compact. This is a noon chart for the date adjusted from the Gregorian calendar. It is really Scorpio rising. With the dutch Gieles minus 1 system I rectified the Marc H. Penfield’s The USA horoscope. I am busy to publish a book on the subject. The progressive aspects on date are from 4 july 1776 till 2021. If take a look at the major milestones of US history, it would see some correlations for example, between the civil war and the WWII or between the great depression and the subprime crisis. If it is a case, then, the evening of 4 July 1776 might be the Sagittarius rising of USA. Pluto in capricorn(=empire) conjunct the South Node is enough for the Scorpio tone in the US identity, transformations etc., USSR also had pluto on the nodes.